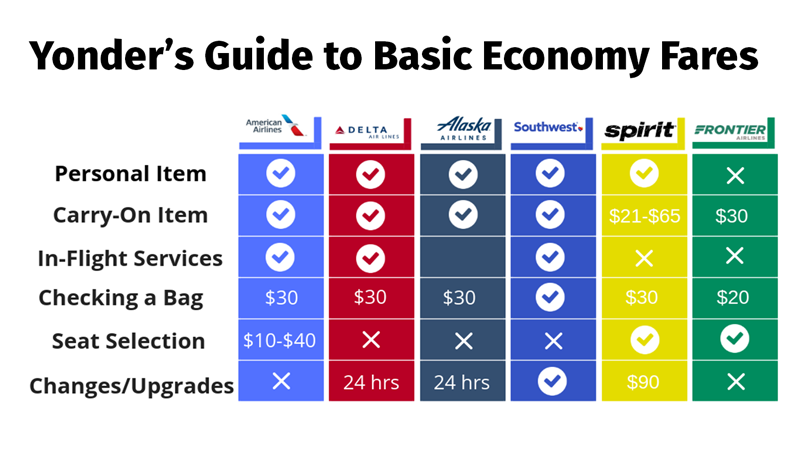 When you hear “Basic Economy airfare”, what do you think? Carry-on Baggage | As of September 2018, you get to bring one carry-on and one personal item with you for no additional fee. In-Flight Services | As a Basic Economy flyer, you’ll have access to the same snacks and drinks as the rest of the folks in the Main Cabin. Checking a Bag | If you need to check a bag, it’ll add to your total travel expenses — it’ll cost you $30 for your first, $40 for your second, and $150 if you have a third. Seat Selection | To select your seat, you’ll have to pay anywhere from $10 to $40, and you still won’t be able to choose it until 48 hours before the flight. If you opt out of the seat assignment fee, you won’t be assigned your seat until you check in. For international flights, you can pay to select your seat at any time when flying Basic Economy. Boarding | With a Basic Economy ticket in hand, you’ll be the last group to board your flight. Changes & Upgrades | Once you book your ticket, there’s no going back to change your flight or even upgrade–so be sure you’re up for a no-frills flight before you confirm. Carry-on Baggage | You’ll be able to bring one carry-on item and one small personal item, free of extra charge. In-Flight Services | Basic Economy travelers will have access to the same in-flight food and drink options as all main cabin flights. Checking a Bag | On Delta Basic Economy, checking bags will cost you. If you’re traveling domestically, your first checked bag will cost $30 and your second will be $40. If you’re traveling internationally, however, that first bag will be $60 and the second will be $100. Neither domestic nor international flights will allow for a third bag. Seat Selection | You can’t select your seat, even for an extra fee–it’ll be assigned to you at check-in and that’s that. Boarding | You’ll board according to your seat assignment, but you won’t be able to upgrade to Priority Boarding. Changes & Upgrades | After 24 hours, you won’t be able to change or upgrade your Basic Economy ticket. Carry-on Baggage | You can bring a carry-on bag with you for no additional fee, as well as one personal belonging like a purse or small backpack. Seat Selection | You get a seat assignment right when you book, so you won’t have to wait until you check in at the airport. Checking a Bag | Checking a bag with a Saver Fare will cost the same as standard main cabin fares–$30 for the first, $40 for the second, and $100 for each bag after that. *If you’re traveling to and from a destination within Alaska, your first and second checked bags are free! Seat Selection | All Saver Fare ticket holders will be seated at the very back of the plane–no exceptions. Boarding | With a Saver Fare ticket, you’ll be part of the last group to board. Changes & Upgrades | Once you get past the federally-mandated 24-hour cancellation period, you won’t be able to change, cancel, or even upgrade your ticket. Though Southwest Airlines is against the idea of offering a fare that strips down amenities, it does offer several tiers of pricing, with the lowest called “Wanna Get Away”. Carry-on Baggage | You can bring one carry-on and one small personal item free of charge! Read our blog post about our picks for TSA approved luggage. Checking a Bag | Southwest is one of the only airlines that currently allows passengers to check not one, but TWO bags, even for domestic flights. 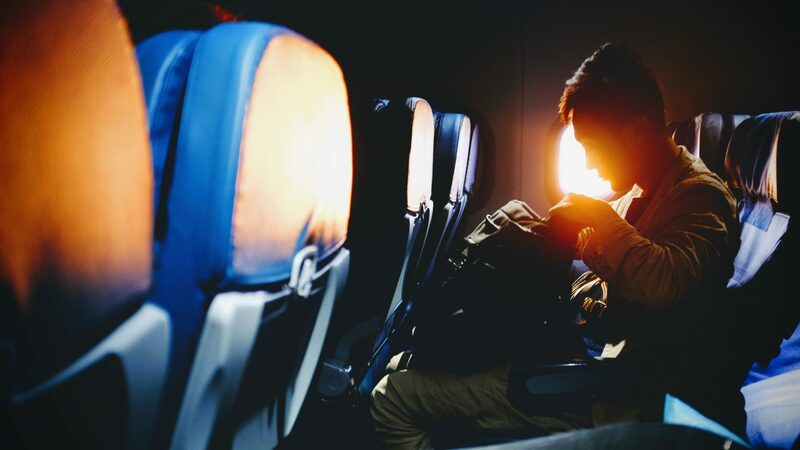 In-Flight Services | Wanna Get Away travelers have access to free snacks and non-alcoholic beverages, and can purchase alcoholic beverages if they choose. Seat Selection & Boarding | On Southwest, you won’t select your seat in advance–you’ll check-in for your flight 24 hours in advance or later, and you’ll be assigned a boarding group according to the order of check-in. Once you get on the flight, you can choose any available seat. Changes & Upgrades | All Southwest tickets can be canceled or changed at anytime prior to flight boarding. With Wanna Get Away tickets, you won’t get a refund, but you will get a full account credit that you can use at a later date. Spirit Airlines fares are ALL essentially Basic Economy. They’re a “no frills” airline that allows you to pay more for literally any amenities if you so choose. Carry-on Baggage | You can bring a small personal item with you free of charge. If you want to bring a carry-on with you, you’ll pay anywhere from $21 to $65, depending on when you decide to pay for it. Checking a Bag | If you need to bring a checked bag, pricing starts at $30 and increases depending on how many bags you need to check and when you opt to pay for them. In-Flight Services | If you find yourself hungry or thirsty on a Spirit flight, it’ll cost you–not even a ginger ale will be complimentary. Seat Selection | You can choose to select a seat for free at check-in, or for $5 in advance. Changes & Upgrades | One piece of good news with Spirit is that you can change or cancel your itinerary for $90, unlike most airlines, who often charge you upwards of $200. Much like Spirit, all Frontier Airlines tickets are low-rate and do not include any amenities, though you can choose to pay for them if you’d like. Carry-on Baggage | For everyone who flies on Frontier, you’ll pay $30 if you choose to bring a carry-on when you book the ticket and $60 if you wait to pay at the gate. Checking a Bag | Checked bags will cost you $25 if you choose to pay when you book and range up to $60 if you gate check. Seat Selection | If you’re up for sitting wherever, you can hop on a Frontier flight without paying an additional fee. If you want to choose, though, it’ll cost you $6. Boarding | Boarding will be according to your seating group, with no exceptions. Changes & Upgrades | No changes or upgrades can be made after you book your flight. In-Flight Services | On Frontier, not even a glass of juice comes with your fare–that’s how few amenities we’re talking about. You’ll have to pay for any food or beverages. JetBlue does not yet offer Basic Economy fares, but stay tuned–they’ve stated that they’ll announce lower-rate fares with fewer amenities by the end of this year! Pro-Tip: Because most Basic Economy fares don’t allow you to change your flight–and certainly not to cancel it–after the initial 24-hour period, you might want to consider travel insurance that covers that sort of thing. Got a story about a time you flew Basic Economy you’d like to share? Tell us about it on Instagram, Twitter, or Facebook!